In Aroostook, Maineâ€™s largest and northernmost county, cyclists traverse wide open spaces and rolling countryside, encountering "big skies", historic communities, very little traffic, and the countyâ€™s deep-rooted Acadian history. This part of Maine is called simply "The County." The rolling green landscape is a checkerboard of farm fields and small towns, while above, the sky stretches for miles. 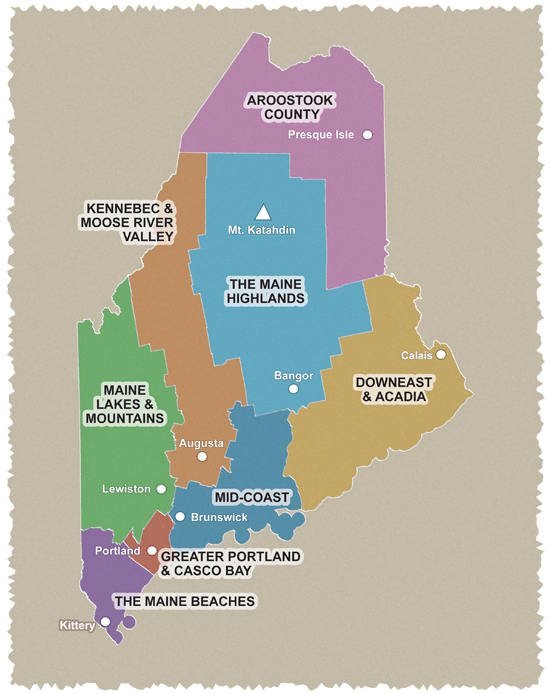 This is also one of the most culturally distinct regions of Maine. Native Americans, Acadians, and Swedes have called this region home for many generations. The 33-mile loop is very scenic and challenging with mountain views—including Mt. Katahdin, the state’s highest peak—and picturesque farms. The north Maine woods and Mt. Katahdin provide the dramatic backdrop for the extremely challenging 46-mile loop. This loop takes cyclists through woods, open farmland, small lumbering communities, and over hills that heave the roads from ridge to ridge—hills that make this ride memorable. The final stretch between Patten, Sherman, and Island Falls lies in the shadow of Mt. Katahdin, and the views of the peak are awe-inspiring.